Valley Proteins, Inc. | Making A Sustainable Difference. For almost 70 years, Valley Proteins, Inc. has been a leader in providing an invaluable service to global economies and the environment. Through our core competencies in rendering and recycling, Valley Proteins sets the standard in creating valuable products from renewable resources. Our focus has always been on customer service. Our foodservice, meat processing and supermarket customers rely on us to provide prompt, reliable collection and recycling services directly tailored to their needs. Our clean and efficient plants utilize advanced continuous rendering processes that result in advanced production methods, less energy consumption and better products. Made from the freshest ingredients, we produce sustainable high-protein, high-energy feed ingredients that nourish our global food supply. Our strong commitment to a sustainable future leads us in the development of biofuel ingredients produced from recycled restaurant used cooking oil (UCO) and animal fats. Together, these essential services help reduce our carbon footprint, and protect the health of our fragile environment. We offer rewarding careers in a variety of transportation, operations, technical and professional disciplines. 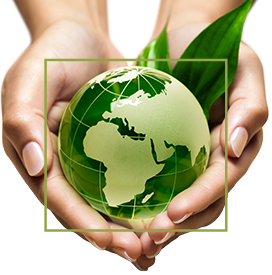 We provide recycling services throughout the contiguous United States utilizing our efficient manufacturing facilities. We are a leading exporter of poultry-based fats and proteins to feed manufacturers, and renewable energy ingredients for the biofuel industry worldwide. Our VP Customer Care team is ready to help. Whether you are an existing customer, or would like to sign up for new service, we are ready to serve your immediate recycling needs.